Ahh, the peaceful paddle! 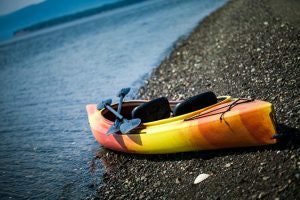 Whether that brings to mind time spent hearing the lapping water or the thrill of surfing ocean waves, you can certainly count on great kayaking when in Ogunquit. Highlights will include actual time spent in fresh air and wildlife sightings worth sharing on Instagram, Facebook or Pinterest. Ogunquit is the spot for a kayak adventure. Often called the best beach in New England, there are endless possibilities that come with over three miles of sand. And one of them is kayaking along the river or for a real challenge, in the river mouth. With the swift Ogunquit River current and the ability to catch the tide change, a seasoned kayaker will enjoy the challenge and the scenery. Sure a day at the beach is nice, but the breathtaking views and an unmatched opportunity to spot wildlife at the Rachel Carson Wildlife Refuge are spectacular. This spot is tidal marsh so you will want to do a little research on the best time of day to kayak. Be sure to follow the signs that say “Carry In Boat Access Only” and follow the conservation rules that regulate the refuge. Yeah, there’s a little homework and prep to this kayak experience – and it’s worth every moment. If the wide open ocean is calling, then Long Sands Beach maybe your spot. With a long shelf, the waves tend to be perfectly to practice open water kayaking. And if you crave an adventure, head out to see the Nubble Light from an ocean viewpoint. It is one of Maine’s most photographed lighthouses – this way, you’ll get your own special pic for sharing. The York River feeds into York Harbor and it’s a kayaking dream. With a Town boat ramp on this river at the Bridge on Route 103, there’s a spot to park and spend the day paddling past fisherman, historic rooms and even farther. Plus if you get hungry, stop in at the York River Landing for a bite – the restaurant is directly on the river with a kayak landing for you. Yes, sure it’s fun to paddle about and just take in the scenery. But maybe you’re a bit more goal orientated. For those folks, put in at Wells Harbor and head up the Webhanet River to the Mile Road Bridge (your “destination” point) . You’ll spot Billy’s Chowder House – and while you can pack a picnic and enjoy the small beach by the boatyard, you could also grab a spot inside Billy’s for their famous chips and lobster roll. You are in Maine after all and lobster will provide fuel for the return time. Buttery, tasty fuel. Still not sure about kayaking in Ogunquit? Add a little outdoor fun with a hike at Mt. Agamenticus or a drive to the top to see the sights. Ogunquit from this view is absolutely charming. Be sure to bring your camera. There really is nothing as refreshing as the crisp Maine air to super charge you for a great outdoor kayak adventure. If you’re thinking of visiting our Ogunquit hotel for your kayaking vacation, to enjoy a cocktail in the pub by the fireplace or to head to Maine just for fun, check out our specials and great hotel room choices with a central location.